Do You Have an Illegal Parking Lot? Not only is creating handicap accessible features in your parking lot a good idea for business, but it’s also the law. If your parking lot doesn’t include certain features, you could face a big lawsuit and major fines. The Americans with Disabilities Act, known as the ADA, was passed in 1990 with a number of provisions protecting people with disabilities. The act required public facilities to provide access to people of all physical abilities, including providing things like wheelchair ramps, modified bathroom facilities, and elevators or other accommodations for buildings higher than one floor. The ADA applies to business throughout Arizona and the rest of the country. In 2012, it became a federal requirement to comply with Title III of the act, which concerns the removal of barriers to public and commercial facilities. A parking lot that does not include handicap accessibility would be considered one such barrier. If your parking lot is not already compliant, you need to upgrade it to ensure that it is. If you are investing in new Peoria parking lot paving, you need to be sure that the design complies with the law. You must designate a certain number of parking spaces — one for every eight — for those requiring a van with a lift. These types of vans are typically used for those who use a wheelchair, and the lift allows them to get in and out of the van safely. The parking space must have enough area on either side of it for the lift, even if there is a car parked in the adjacent space. The parking space must also have a sign showing that it is accessible for vans. You may want to designate additional accessible parking spaces if your business accommodates a larger number of disabled customers. However, you will need to stick to the minimum no matter what number of disabled customers you serve. Things that might not seem like barriers to you can be big barriers to those with disabilities. For example, a small curb can mean the difference between a person in a wheelchair getting into your business or not. You can actually remove barriers such as cutting away the curb at certain spots on your entry way, or you can remove the barriers metaphorically by adding alternative accessibility routes, such as an entrance ramp. You may also need to make some architectural changes, such as the removal of stairs at the doorway and the addition of automatic doors. The United States Access Board has similar requirements for accessibility, though they vary slightly. For example, the USAB requires that a certain number of parking spaces be handicap accessible, but the numbers are generally lower. Instead of one in eight spaces, the USAB asks that businesses only have one in 25 spaces. The numbers get even lower as the parking lot gets bigger. Only five spaces are required for parking lots between 101 and 150 spaces, six for up to 200, seven for 201 to 300 spaces, eight for 301 to 400 spaces, and nine for 401 to 500 spaces. For parking lots between 501 and 1,000 spaces, only 2 percent must be designated handicap accessible. The formula gets a bit more complicated for parking lots over 1,000 spaces. The USAB also says that only 50 percent of the entrances must be accessible, creating a more specific rule for accessibility rather than stipulating a general “removal of barriers” for entrance. The USAB rule suggests that a ramp may need to be installed directly from the parking lot. Finally, the USAB requires that an accessible route be created from the handicap designated parking spaces or unloading zones to the entrance of the building. The route should be direct, and it should be free of barriers, of course. Most businesses meet this requirement by creating handicap accessible spaces right in front of the entrance and then painting an accessible path on the pavement leading up to the sidewalk or entry way. There are more requirements stipulated by both the ADA and the USAB, but these are the big rules that most businesses follow when installing their parking lots or designing their entrances. You will have to pursue the complete list of regulations yourself or consult with an attorney or contractor to understand the requirements in full. Roadrunner Paving and Asphalt Maintenance can help you understand the requirements and ensure that they are implemented in your parking lot design. 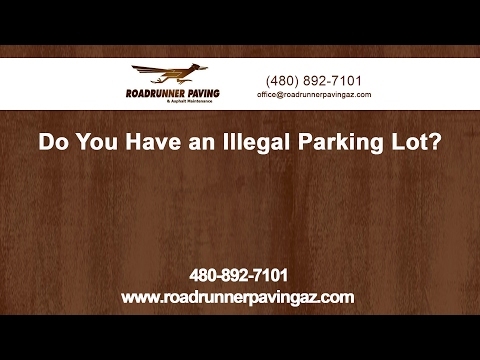 We aren’t legal experts, but our Phoenix AZ asphalt company has been installing parking lots in Arizona for many years, and we have helped numerous businesses become compliant. When you are investing in new parking lot paving, we can help you create a design that is compliant with the law. If you have a current parking lot, we can review it and help you make changes that get it in compliance. We also provide paving and asphalt maintenance that can help you protect your investment. Not only do cracks and potholes create a safety issue for your disabled customers, but they also make your business look bad and cost you money. Our maintenance can help you keep your parking lot in top shape and save you money in the long run.